The Mongols came to rule much of Asia and Europe during the 13th century, becoming one of the largest empires ever by land area, contested only by the Russian Empire and the British Empire. The Mongols are one of several Eurasian nomadic peoples; neither the first nor the last to expand across the steppes. While the Mongol conquests were among the most destructive in world history, they created a lasting heritage on the Eurasian supercontinent. The Empire was founded by Genghis Khan (c. 1162 – 1227), born with the name Temüjin. Before him, the Mongols were split into many tribes, often at war with each other. They had been raiding into northern China for centuries and the Chinese had built the Great Wall to keep them out, but China had usually been able to keep the threat to a manageable level with a divide-and-rule strategy. That all changed when the Great Khan united the tribes into a single nation; even today, Mongols regard him as the founder of their nation. There was some fighting involved, but he united them mainly through diplomacy including promises of shares in the loot from campaigns against non-Mongols. The unified Mongol force first defeated the Western Xia, centered in today's Ningxia, who became Mongol allies. Then they broke through the Great Wall and conquered much of northern China. Mongol warriors, mainly mounted archers, were superb fighters and extremely mobile, and the Khan was a tactical genius; the Mongols repeatedly won battles despite being badly outnumbered and despite their enemies having fortified positions. The Khan invaded China with about 100,000 men when the Chinese had well over a million in their armies, but the Mongols won most of the battles and killed about half a million of the enemy. The Khan's goal was to conquer all of China, both avenging what Mongols saw as centuries of abuse and acquiring enormous wealth. He was well on his way to that when he was distracted by events further west. He had sent envoys to the Persian Empire and the Persians made what was quite likely the greatest blunder in diplomatic history, sending back their heads as a gesture of contempt. Infuriated, the Khan turned his armies west and within a few years conquered most of the Persian Empire, killing close to half its population in the process. Genghis' son Ogedai Khan, completed the conquest of northern China, ending the Jin Dynasty, and invaded Korea. In the west, his forces completed the conquest of the Persian Empire, took large territories in what is now Russia, and pushed as far as Syria, Hungary and Poland. After Ogedai's death in 1241, there was a complicated power struggle; this may have saved Western Europe and other areas since the Mongols were too busy fighting each other to push further West. Möngke Khan emerged from the chaos to rule 1251–1259. He did more consolidation than conquest, but did conquer the Tibetan Empire. The next khan was a grandson of Genghis, Kublai Khan; he completed the conquest of China, moved his capital to what is now Beijing, and became the first emperor of the Yuan Dynasty which ruled China 1279-1368. Marco Polo was in China during his reign and worked as an official of the Empire. From Ogedai's death onwards, the Empire was often in turmoil as various descendants of the Great Khan vied for power. By the time of Kublai's death in 1294, it was split into four great kingdoms — the Yuan Dynasty plus the Golden Horde, Chagatai Khanate and Ilkhanate — as shown on the map to the right. After that, the Chinese Empire shrank considerably and the western khanates split further. In many areas dynasties descended from Mongols, often intermarried with local nobility, ruled for centuries. The Yuan Dynasty version of the Chinese Empire included areas that had not been part of any previous Chinese Empire, Mongolia itself (both the modern country of Mongolia and the what is now the Chinese province of Inner Mongolia), the territory of Mongol allies the Uighur (now known as Xinjiang), and Mongol conquests such as the former Tangut kingdom (the center of which is now Ningxia), Tibet, Manchuria, Korea, parts of what are now Central Asia and Myanmar, and quite a bit of what is now Russia. Tamerlane or Timur the lame (circa 1330 to 1405) was a descendant of Ghengis Khan, and the last of the great Asian nomadic conquerors. His dream was to restore the Mongol Empire to its glory days and he made considerable progress toward that; he reunited the remnants of the three western khanates and was en route to attack China when he died. He took cities as far apart as Delhi and Damascus, and one of his allies burned Moscow. His capital was Samarkand and his palace there, the Registan, is now a UNESCO World Heritage Site and a major attraction for travellers on the Silk Road. Babur (1483-1530) was a great-great-grandson of Tamerlane whose family ruled the Ferghana Valley east of Samarkand. He led an army south along the same route as Tamerlane and founded the Mughal Empire which ruled much of what are now India and Pakistan for centuries. From the 16th century — having at long last defeated the Golden Horde and its remnants — the Russian Empire came to be the dominant power in northern Eurasia. However it was not until the 19th century that they were able to control all of Central Asia. Mausoleum of Genghis Khan (成吉思汗陵; Chéng​jí​sī​hàn​líng​) (Located in the community of Ejan Horo Banner 55km south of Dongsheng, Inner Mongolia). ¥25. 47.92036106.915381 National Museum of Mongolia, Ulaanbataar, To the left of the Government House. This is the main museum in the capital and holds the most important artifacts of the Mongolians' rich history dating back several thousand years. These include ethnographic displays of different tribes of Mongolia, petroglyphs and cave drawings, Turkic monuments, weapons, armor, and various displays from the Hun and Mongol Empires, the Chinese rule, Communist era, and the democratic revolution in 1990. There is even a display of self-portraits and personal possessions of Genghis Khan and other great khans of the Mongol Empire. Most displays are in English and Mongolian. This should be a first stop on any visit to the city. 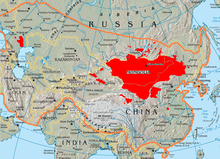 This travel topic about Mongol Empire is an outline and needs more content. It has a template, but there is not enough information present. Please plunge forward and help it grow!